Have a Penny Social at your next event! Does your fundraising event need a pick-me-up, a little pizzazz? Why not change things up with the mystery and fun of a Penny Social? 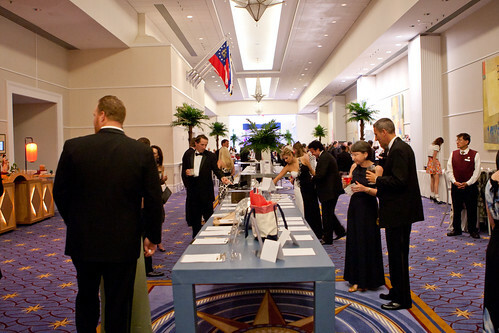 Also known as Tricky Tray or Pick-a-Prize, this type of event is a combination of a raffle and an auction. Like a silent auction, you provide an array of prizes and put them on display. Like a raffle, guests buy tickets. But in this case, each prize has a “hat” or bucket next to it and the guests “vote” for their favorite items by depositing their tickets in the bucket for each item. The more tickets they buy, the more chance they have of winning. And because the tickets are cheap, the winner can really get a deal. Each participant can buy as many tickets as he wants. There’s no limit to how many tickets can be placed in a single bucket. Once all the tickets have been spent, the emcee selects a single ticket from each item’s bucket and announces the winner. Note: Keep in mind that most states regulate or even may prohibit raffle ticket sales. Be sure to check your state’s laws about raffles. Very often Penny Social feature themed bundles of prizes (a baker’s dream, a day at the spa) with physical items and gift certificates that fit the theme. Seek out donated items to maximize your revenue. At the same time, keep in mind the types of items your guests really want and will compete with each other to win. Popular items include dinner out, vacation packages, spa packages, consumer electronics and anything to do with celebrities. You can use paper raffle tickets; they are small, cheap and have pre-printed numbers, which makes it easy to identify the winner. Sell your tickets in bundles of 25, 50 or 100 tickets. By pre-packaging them and pricing them in even amounts ($20, etc. ), you’ll make it quick and easy for guests to buy large amounts of tickets. Or, if you have auction software, your guests can purchase virtual raffle tickets online or with their phones and “vote” for their favorite prizes electronically. To select the winner, use your auction software to generate a separate spreadsheet for each prize, listing the raffle tickets one per line. Then use a random number generator website or app (such as random.org) to choose the winning ticket for each prize. For more details, visit Raffle Tickets – Tips and Best Practices. Setting up the physical space is much like setting up a silent auction. You want to provide plenty of tables and arrange them to maximize traffic flow. You can decorate the tables to make them more festive or to match the theme of your event. By grouping items into categories, you’ll make it easier for your guests to find the prizes that interest them the most. Provide a table tent or description sheet listing the contents of each package. Place the “hat” or bucket prominently next to the item. You want to allow your guests plenty of time to spend their tickets. Generally Penny Socials run about two hours. You could also hold back some really special items for the end of the event. Then your guests can by extra tickets for these last-minute drawings. With the fun and novelty of a Penny Social, you can perk up enthusiasm for your fundraiser and provide an affordable way for everyone to join in the fun. What’s your experience with a Penny Social? What tips can you suggest to make it really successful? Share your thoughts in the comments below.